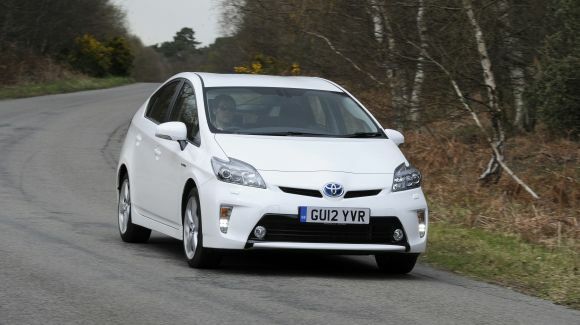 Home > Cars > Prius > How does Toyota Hybrid Synergy Drive work? Since 1997, drivers have enjoyed better fuel economy, lower running costs and unrivalled levels of comfort and refinement thanks to Toyota’s hybrid technology. Today, Toyota’s range of seven hybrid cars encompasses small hybrids like the Toyota Yaris Hybrid, family-sized cars like the Toyota Prius, Auris Hybrid and C-HR even estates like the Auris Hybrid Touring Sports. But have you ever wondered how hybrid cars work? Read on to discover exactly what Toyota’s Hybrid Synergy Drive system is, how it works and how it benefits the environment and your wallet. Simply put, a ‘hybrid’ is a vehicle with two or more power sources. Most hybrid road cars use a normal internal combustion engine paired with an electric motor, but the way these work together means that there are three different kinds of hybrid setup. Beginning with the original Prius, Toyota pioneered the ‘full’ hybrid system that uses two separate powerplants – a battery-powered electric motor and petrol-driven combustion engine – which can work together to drive the vehicle or can each be used in isolation. It is the most popular hybrid system in the world, and has sold more than 10 million units since the Prius was launched in Japan in August 1997. The second kind of hybrid is known as ‘parallel’. It uses a normal combustion engine as the main source of power, with an electric motor fitted between the engine and gearbox to provide assistance. This arrangement tends to be more restricted in its function that a ‘full’ hybrid, and fitting an electric motor into a very small space also limits its power and EV (electric vehicle) range. Lastly, the third hybrid variation is the ‘series’ type. In this type of vehicle the electric motor provides all the drive; the normal combustion engine isn’t connected to the transmission, and instead works as a generator to power the electric motor. The main hurdle for a ‘series’ hybrid is maintaining its efficiency once the battery power has been used up, and for this reason, ‘series’ hybrids are rare. How does Hybrid Synergy Drive work? Toyota’s Hybrid Synergy Drive system is comprised of six primary components: a petrol engine, an electric motor, an electric generator, the power control unit, and a power split device that uses a special type of gearbox to smoothly distribute power from the engine, motor and generator. As a complete system, Hybrid Synergy Drive is clever, fuel-saving technology that can seamlessly and automatically switch between electric power and conventional engine power. Capable of adapting to different driving conditions, Hybrid Synergy Drive intelligently controls the power coming from both sources and tells the car how to combine them for the greatest efficiency and performance. As its name suggests, the system delivers true synergy between the two power sources. When the engine is running, it charges the battery via the generator; when driving conditions allow it, such as in slow-moving traffic, the generator can cut out the petrol engine and let the electric motor take over for zero-emissions travelling. The sophisticated engine management system can sense when the car is stopped and will switch off the engine to conserve power and cut emissions, automatically starting up again when needed. The battery is kept well charged by the system, so a Hybrid Synergy Drive-equipped Toyota won’t need to be plugged into a mains supply to be recharged. However, Toyota does produce the Prius Plug-in for people who can make use of its greater range of more than 30 miles in electric-only EV mode – this type of vehicle is a ‘Plug-in Hybrid Electric Vehicle’ (PHEV) that can use mains power to supplement the onboard charging system, but still has the petrol engine so you’ve no worries about its range. Toyota’s Hybrid Synergy Drive system charges the battery in two ways. Firstly and as already mentioned, the petrol engine drives the generator to charge the battery. The second method is through regenerative braking, a system that puts braking energy to good use. Every time you put your foot on the brake or lift off the accelerator, the system diverts energy back to the battery where it is, in effect, recycled. Instead of the energy being lost as heat or noise from the brakes, it is captured and then used to power the electric motor later. This is particularly efficient in stop-start traffic where the system recovers and stores a great deal of energy, making the car more efficient overall. For a PHEV like the Prius Plug-in, the onboard battery can also be charged at home using the mains supply or at dedicated charging points along your journey, allowing the greater EV range of up to 15.5 miles. The batteries in Toyota’s hybrid vehicles are efficient, corrosion-resistant units design to last, which is why Toyota’s warranty on the battery extends up to 11 years with no limit on mileage – read more about this here. They are substantial units that have to store sufficient voltage to power the car in up to speeds of around 30mph with no assistance from the petrol engine. It’s true that their production does have a small, additional environmental impact, but this is more than offset by the environmental benefits of driving a hybrid car. In fact, we’ve dispelled that hybrid myth, along with others, in this post. Toyota is also keen to recycle the batteries from its hybrid cars, which can be remanufactured to make new batteries or repurposed into other forms of stationary energy storage – this can be arranged through your Toyota dealer. The automaker already recovers over 90 per cent of hybrid batteries from its vehicles, and is targeting a 100 per cent recovery rate. Is the engine different to that of a normal car? In short, yes! The internal combustion engine used in a Hybrid Synergy Drive Toyota uses a slightly different engine cycle than the conventional ‘Otto-type’ four-stroke cycle. Called the Atkinson cycle, this modified four-stroke cycle produces less heat and is therefore more efficient. By cooling the internal combustion chamber using recirculated exhaust gases, it avoids a problem faced by engines with traditional cycles: injecting more fuel than necessary to reduce combustion temperatures and prevent the catalytic converters from overheating. The traditional remedy works, but uses more fuel in the process. However, Toyota’s solution is more fuel-efficient and is phenomenally reliable. A more in-depth analysis of Toyota’s use of the Atkinson cycle can be read here. Not at all. Because Toyota has made the Hybrid Synergy Drive system fully automatic, it will optimise its operation and minimise fuel use for each driver. You can sit back and enjoy the drive! If you’d like to know a bit more about Toyota’s hybrid technology and how it works, enjoy watching this special ‘Mythbusting’ video by actor and technology presenter Robert Llewellyn. I don’t understand all the moaners here, I have a 2005 Prius and it’s amazing, quiet, cheap road tax and 50’s mpg….it’s the best car I’ve had so far, won’t be going back to conventional cars….. Apologies, we replied to your previous message without seeing this one. You’ve answered our question by providing the mileage! You’ve got 30,000 left until you qualify for our bronze sticker. Thanks. I bought a 2yr old Yaris hybrid with lowish mileage -13,000mls, a few weeks ago and am dissappointed with the mpg, currently 57mpg on the display. (our previous 17 yr old, old technology, petrol Yaris managed an average 50+mpg consistently over 15 yrs of driving). I am driving steadily, within speed limits, anticipating junctions, avoiding excessive acceleration, no air con, etc, but notice that the petrol engine cuts in almost as soon as I switch on, and keeps running for a while even if I am stationery in traffic. Isn’t the eelctric motor supposed to take over in these circumstances. How far is the car supposed to travel on electricity before the engine cuts in? 10 mtrs, 100mtrs, or 1,000mtrs? Thanks for getting in touch. If you could please provide a reg or VIN, we will be able to assist you further. I have recently bought a Toyota Yaris Icon Hybrid, can anyone tell me if it is worthwhile using the eco mode and when it is best to use it? Thanks for getting in touch. ECO mode is suitable for improving the fuel economy, because the torque corresponding to the accelerator pedal depression amount can be generated more smoothly than it is in normal conditions and the operation of the air conditioning system (heating/cooling) will be minimized. Eco drive mode controls the heating/cooling operations and fan speed of the air conditioning system to enhance fuel efficiency. To improve air conditioning performance, adjust the temperature setting or fan speed, or turn off Eco drive mode. I have aqua 2015 S model. I have driven it on weekend and it was a long drive of about 200+ km. However my EV battery showed good charge of about 9/10. As soon as i was in local drive in low gear, vihicle was working fine on EV mode but battery terminal drops to 3/10. It used to be quite sudden, but no issue otherwise. Can someone suggest what is the problem or is it ok??? First of all I have a 2017 Toyota Prius and I love the vehicle. I’ve been taking freeway to work and the surface streets back (instead of freeways PHX-USA) and have been getting 60+ MPG. Seriously, took picture did 602 miles on 10.04 gallons of fuel. Made it to Vegas and back on one tank 614 miles. I don’t recommend it, I was real nervous going up the last hill to Kingman. Does Toyota have a general electric motor blog? What an impressive journey! Unfortunately, Toyota GB does not have a general electric motor blog. Hi. Just wondering why the RAV4 hybrid is not in the list of hybrid s. . Is it an older, less efficient hybrid that you disown ?? Just ordered one. . So a bit concerned. ! ! Thank you for pointing this out, this blog post was written before the RAV4 Hybrid was announced, therefore it has not been updated. We are sorry about this, we are currently updating this article now. We hope you enjoy your new RAV4 Hybrid! I have just bought the Auris Estate Hybrid. For the first week I loved it. Was on 72mpg and over 60mpg locally. I have always bought cars for their fuel efficiency (having had LPGs for last 15 years) and driven efficiently. I find the fuel economy has been similar to that of my LPGs. The big benefit of LPG was that I could chose when to run on Petrol or LPG. Such a button on this car would make it very good. Similar to Jean’s comment above, I know my commute and know exactly where and when my battery needs to be charged. Yet the car is trying to charge the battery using petrol as soon as I start the car when it really doesn’t need to as I know I am about to descend a massive hill. This last week, even with the weather actually being warmer than last week, the petrol engine has started kicking in within 5 seconds of hitting the Power button. I would understand if it just needed to lubricate the engine, but it seems to be putting all its energy (fuel) into charging the (already full) battery. Yet, I always get home with the battery as fully charged as it can be and live at the top of a hill, so should be able to get to the main road without using any fuel.Yet for the last week the petrol engine has not only kicked in, but seems to be spending all its fuel on charging the already full battery and won’t go above like 15mpg all the way down the hill!?! This is extremely frustrating and surely this cannot be right?! It even starts the petrol engine when I’m doing the school run. So I will have been driving for 20 minutes, parked for just 10 minutes, start the car again and the petrol engine kicks in! So frustrating. This would be an ideal time and location, to just be slowly driving along on battery only. What is going on? To pre-empt any obvious answers… no I do not use A/C nor heating. I am not the variant. First week, car drove as I would hope. 2nd week, manifesting the problems described above. It is only 2 years old and only just done 14k and had a service before purchase. 1. If the HV battery State of Charge becomes below a predetermined value, the engine will run in order to run one of the electric motors (incorporated in the transaxle) and charge the HV battery. 2. If the coolant temperature is below a predetermined value, the engine will run in order to keep the temperature of the catalytic converter at the correct levels – as the catalytic converter will only work efficiently above a certain temperature. 3. If the vehicle’s heating system is being used (not necessarily in conjunction with the A/C), the engine will run in order to warm up the coolant so that the vehicle cabin can also be warmed up efficiently. I’ve had an Auris (which I liked a lot) since 2009 and I exchanged it for an Auris Hybrid a month ago. I love this version of the Auris. Being fully automatic it’s a dream to drive, it’s more pokey than the 1.6 litre version, it’s glued to the road and crucially it is so economical – getting 60-odd miles per gallon and one one occasion 68 mpg; and it’s rising as the petrol engine runs-in. I only do 7,000 miles a year so I need to fill up with petrol just once a month. It’s motoring for free! Thanks for getting in touch. We’re glad to hear how much you love your Auris Hybrid and we wish you many more happy miles ahead. Thanks. What Euro Engine size is Toyota Prius vvt I 1.8 Hybrid Electric .first registration of the car March 2014. Thanks for getting in touch. This vehicle complies with EURO V emissions regulations. Thanks. I have just bought a 63 plate Prius, but the battery EV mode cuts out when l am driving at 20 mph, l had a 08 prius prior to buying this car and the battery cut out at 30 mph, why the difference of 10 mph in a newer mpdel car? Thanks for getting in touch. The difference in EV mode greatly depends on the State of Charge of the HV Battery, which greatly depends on the driving and road conditions. Thanks. Is it ok to stop the engine when the car is automatically accelerating to charge its Hybrid battery? Hi Indika. Thanks for your comment. Can you please rephrase the question? We’re not sure what you’re asking. Thanks. For Lexus LS 500, at what speed does the engine shut down and the battery start running the car? My car 1. 8 2009 toyota Prius it can’t start n says to check hybrid system check on screen. Wat would be the problem in there ?? Thanks for getting in touch with us. The hybrid system is supported by a sophisticated diagnosis system. However, it is necessary for a Toyota Center technician to use their diagnostic tester in order to point you to the direction of the defect. You can find your closest Toyota dealer here: https://www.toyota.co.uk/find-your-dealer.json. I am just about to collect my 8th Yaris. The last two, and the new one, being hybrid. I love them, I get about 58/60 miles to the gallon. Can the Auris hybrid be charged from the mains by plugging in, or is it charged only by its petrol engine during driving? Thank you for your comment. The Auris Hybrid doesn’t need to be plugged in, it is charged while driving. Hope this helps. Thanks, but I know that it doesn’t need to be plugged in. I was asking if it has the option of being plugged in to charge the battery and thereby reduce petrol consumption still further. The option of heating the car electrically before starting journeys in winter would also be good. The Auris Hybrid is being charged through normal driving and cannot be plugging in. The only plug-in car we have is the Prius Plug-in, you can ready more about it here: https://blog.toyota.co.uk/introducing-new-prius-plug-in. Hope this helps. Thank you for your comment. The battery is being charged through normal driving so there is no need to worry about plugging it in. The battery will last the lifetime of the car, which means it will last as long as the other components of the vehicle. Hope this helps. I have a Lexus hybrid and enquired if I could have a plug in fitted to it and was told that was not possible. As Lexus has the same engine as its stable mate Toyota – how can that be? Should I ask Toyota to fit it and would they? Thanks for your post. We would not advise going anywhere than your Lexus dealer for any alterations to the standard vehicle specification. We would suggest getting back in contact with your dealer or contacting the Lexus Customer Relations team. Many thanks! I have just bought a Yaris Hybrid (the one that recharges the battery when braking) and as I’m in Spain the calculation of petrol consumpsion is done a different way. It’s calculated as how many litres you use in 100 kilometres. The figure given for the car is about 3.5 litres per 100 kilometres, but my first tank of petrol has used 5.6 litres per 100 kilometres (34 litres for 600 kilometres). I returned to the showroom to query this extremely high petrol usage, and they said that the first couple of thousand kilometres the car would use more petrol until the engine is properly run in. I thought that engines nowadays are run in in the factory. I drive in an extremely careful and gentle fashion with no abrupt accelaration or braking (I’m a woman), I have never driven over 110 kilometres hour, and I have almost always been in the eco zone (of the revolutions) apart from going up relatively steep slopes which has only been momentarily. The car also changes gear automatically going at 100-110 kilometres hour, which I find extremely strange. In a gear change car I would never go down from the top gear at less that 60 kph. I don’t know how many gears it has, but if it’s changing from 5 or 6 to 4 or 5, it’s absurd. The engine also doesn’t appear to be very potent. As my Opel Corsa of 15 years did this same milage, I’m extremely disappointed with my purchase of 9 days ago and deeply regret it. I bought the car only to have low consumption: the rest doesn’t interest me. I would greatly appreciate any advice. Thank you for your post. Fuel consumption improves with mileage and we would advise that you to speak to your local Toyota Dealer: http://www.toyota.es/#/ajax/%2Fforms%2Fforms.json%3Ftab%3Dpane-dealer. This article provides more information on how fuel consumption figures are calculated: https://blog.toyota.co.uk/how-official-fuel-economy-figures-are-calculated. It is accepted that the test does not represents real world driving conditions but this post will provide you with more information about how fuel MPG is calculated. Hope this helps. You can’t please everyone all the time there will always be moaners, I have a Auris hybrid best car I have ever had in fifty years. Thank you for your post. We are very pleased you love your Auris Hybrid! We really appreciate hearing from owners about their cars. Please feel free to post a picture on our Toyota UK Facebook page. Many thanks. Hi John, that’s impressive and it sounds like you’ve really enjoyed every mile. Wishing you many more in your Auris Hybrid! Hi, I live in the French alps. I love the car, but my Yaris rarely let the battery pack loose more than two bars when I go back up home. Those two bars, I have them back mid way on my way down to the valley and after I still have to do lots of breaking and all this potential energy is likely lost. For daily commute, wouldn’t it be great if the computer/hybrid system learned to optimize fuel consumption not on a standard fashion but truly to take full advantage of the topography and daily commute? If this is not yet possible, can I have my Yaris tuned so that it allows to loose 4 bars that I could easily replenished on the way down? To explain, your Toyota Yaris hybrid will always be driving in the most efficient way possible in terms of conserving fuel. You would not be able to customise the car in the way you have described but you are already benefiting from the local geography because you are able to conserve a lot more energy when travelling downhill. Do you drive in “B” (engine braking) mode when you are doing this? This could help. Also, gentle braking also helps to conserve more energy. You will of course use more energy when travelling back up the hill but any energy lost can be replenished on the way back down. Have you seen our post about getting the most from your hybrid? You can check this out here. Thanks for your response and yes to your questions whether I have read etc…, but I am sorry to say that you are wrong.The optimisation program of the Yaris in my case does not optimise very well this is why I suggest that either it should be enable to learn about your daily journeys or should optimise it as a function of the topography that can easily been access using the GPS. Currently my Yaris is recharging the battery while I am driving up using the explosion engine and arrives at home with only two bars empty which is a waste of energy because if it was 4 or even 5 bars down it would be refilled on the way down. Those two bars are refilled by half way down therefore wasting the rest of the hill down where no more energy can be stored. Yaris could then do better if it would allow for “personal optimization”. Thanks for your post and for your interest in Prius. We mighty need a bit of help as you mention Prius 200. In the UK market we just sell the Prius and this has a top speed of 112 mph. If however you are referring to a different version in a different market then let us know and we will do our best to find out for you. what part switch’s one drive to the other and have there been problems with this issue? The power split device will switch between the electric motor and the petrol engine. Our full hybrid vehicles are very reliable and we have not had any specific problems with the power split device. not good enough, you still need a combustible engine. i have a better idea, to where there’s no need for natural resources. I have a 56 plate Prius which I have owned for three and a half years. It is perhaps the best car I have ever owned. Whilst I am nostalgic for many of the cars that I owned and raced in my younger days, by comparison they were noisy, uneconomic, frequently temperamental and had the ability to attract rust. The Prius, by comparison, is quiet, comfortable and without wishing to be a hostage to fortune, so far utterly reliable. Furthermore since buying it I have kept a detailed record of actual mileage and petrol use and have achieved 52.3mpg. The ten pounds vehicle tax is an added bonus. I am looking forward to trading up to a used plug-in Prius in about three years time. Until battery technology improves dramatically the hybrid is the way forward. Keep up the good work Toyota. Thanks for your post. We appreciate your feedback regarding Prius ownership. Your experience does mirror feedback we receive, particularly in relation to the quiet drive when running on electric power at lower speed. We know the Prius hybrid system is reliable and it is proven and tested over many millions of miles. Good to hear your thoughts about trading up to a Plug-in in the future. This is essentially the next step in the evolution of hybrid and we feel represents the best of both worlds, combining the benefits of electric and hybrid vehicles but with none of the downsides such as “range anxiety” attached to full EV models. Here is more information about Plug-in incase this is of use. why is the mpg so poor? and so much worse than that advertised? I’m getting 47mpg on my new Hybrid and am massively disapointed.! We’re sorry to hear that you’re not pleased with your current MPG figures. The advertised figures, as published by all car manufacturers, are achieved in a controlled environment, as such you may see different results in real-world driving. We have put together a few tips on getting the most out of your hybrid, which you may be interested in seeing, here: http://ow.ly/sddv0. We do hope this helps. If you do think that you’ve got a problem with your car we always recommend visiting your nearest Toyota Dealer as they’ll be able to offer first hand advice. If you are only getting miles per gallon in the 40’s then it is you driving habit that is at fault. If we don’t pay attention to our foot pressure, we tend to always be in accelerate mode – or worse, panic mode, usually in trying to keep up with people who are driving too fast. A lot of this is ‘illusion’ – we see a car going faster than us and we think we are slowing down, or another car accelerates and we think our car is slowing down. and we press down on the accelerator. It is hard to break the habit, but you can by monitoring the real-time display. It is maddening at first, keeping your foot pressure light, but your speedometer doesn’t lie – you are not really slowing down, and you do not need to accelerate, it is an illusion. When I do not pay attention and drive my ‘normal’ lazy illusion-driven way, I only get high 40’s. When I pay attention to my foot, I’ve reached 65mpg. My overall average is 55mpg. Also at lights, you do not need to accelerate hard, or for as long as you think. True, accelerating on just the battery will drive the driver behind you crazy – it requires very slow acceleration, but you can accelerate a lot slower than you think, and let up on the accelerator much sooner than you realize. Acceleration is the biggest gas guzzler, which is why city driving gives you lower mpg’s if you are mostly accelerating away from lights. Pay attention to your foot and don’t accelerate like a banshee – unless you are fleeing imaginary traffic light hijackers (which is another illusion we tend to have) or engaged in traffic light drag races or highway cross-country races to maintain your social status (yes, more illusions that are mpg killers). Quote from above blog “a car with Hybrid Synergy Drive will never need to be plugged into a mains supply for recharging” My car has HSD and I have to charge it from the mains – can someone please tell the writer that Toyota now make a Plugin Prius…. The blog post is referring to the functionality of HSD, for example in the Prius, which doesn’t need to be plugged in to charge as it charges itself when driving. The Prius Plug-In has the additional acpacity to be plugged in to charge to give up to 15.5 miles of EV driving. However, even if it’s never actually plugged in to charge, the HSD system will work as normal, therefore the statment is true.